When you're on a low-carb diet, you're generally limited to 20 to 150 grams per day of net carbs -- total carbs minus fiber. Pasta, which has 30 grams of net carbs per cup, is usually off the menu. 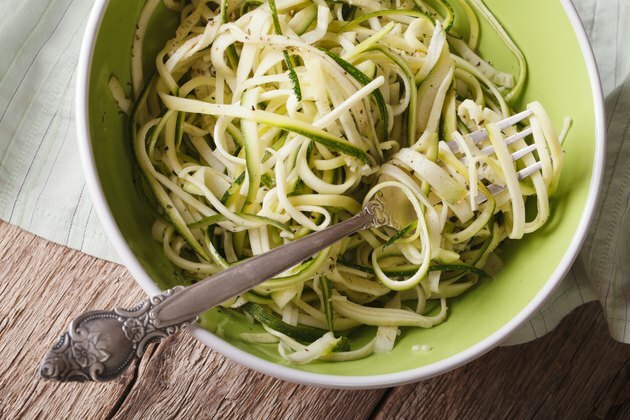 If you've solved the high-carb pasta issue by making noodles from zucchini, using spaghetti squash or experimenting with Japanese shirataki noodles, the sauce may be the source of carbs you want to avoid. Traditional marinara typically contains 7 to 10 grams of net carbs per 1/2-cup serving, depending on the brand. Go for sauces made from cream, cheese and butter to lower the carb count without sacrificing flavor. Carbonara is a rich, velvety sauce made with low-carb-friendly ingredients, including bacon, egg yolks and Romano cheese. The sauce makes a delicious topping for spaghetti squash or zucchini noodles, made by spiraling summer squash into a noodle shape. To make the carbonara sauce, saute chopped bacon or pancetta -- Italian-style bacon -- in olive oil until crisp. In a separate bowl, mix two to three egg yolks with Romano and Parmesan cheese. With a little hot water, add your warm "noodles" to the cooked bacon and fat. Stir to combine. Transfer the noodle mixture to the bowl with the egg yolks and cheese. The heat from the noodles and bacon "cooks" the egg yolks. Stir constantly to incorporate the sauce and avoid curdling. Serve immediately with additional shredded cheese. The cheeses contain about 1 gram of net carbs per tablespoon, and the bacon and egg yolks contain trace amounts of carbs that add up to an additional 1 gram. Butter and Parmesan cheese is a classic flavor combination with very few carb grams. Butter is carb free, and shredded Parmesan contains less than 1 gram of carbs per tablespoon. To use as a sauce, chop the butter into small cubes and stir into warm noodles. Sprinkle Parmesan cheese and black pepper to taste -- stirring more to incorporate. Add a tablespoon or two of minced, fresh parsley for a fresh taste and only trace carbs. Alfredo sauce is a combination of cream, butter and cheese -- all of which are nearly carb-free. Commercial versions sold in jars contain 2 to 3 grams of net carbs per 1/4 cup. The creamy sauce is usually found on carb-heavy fettucini, but use it to coat lower-carb options of zucchini noodles or spaghetti squash. Make your own by simmering together 4 tablespoons of butter in every 1/2 cup of cream. Add salt and pepper to taste. Thin with a splash or two of hot water and stir in a few tablespoons of Parmesan cheese. Toss with your "noodles" of choice and serve. When you think pasta sauce, Italian flavors come to mind, but Asian dishes have delicious recipes for noodles, too. A Thai-style peanut sauce transforms zucchini noodles or shirataki noodles into an irresistible, low-carb meal. Shirataki noodles are made from glucomannan, a starch that comes from the devil's tongue yam.The starch is essentially indigestible, so it passes through you with no impact on your blood sugar. Find the noodles next to tofu in the refrigerated section of some stores. Their bland flavor means they soak up flavor readily. To make the peanut sauce, combine in a small saucepan all-natural peanut butter with a little water, minced garlic, lime juice, soy sauce and a sprinkle of sucralose for sweetness. Add a splash of hot pepper sauce or a pinch of cayenne pepper. Cook over low to moderate heat until the sauce is smooth and thin enough to pour over your noodles of choice. Peanut butter contains 3 to 4 grams of net carbs per 2 tablespoons. The lime juice, garlic and soy sauce together may add an additional 1 to 2 carbs to the sauce.